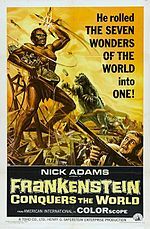 Frankenstein Conquers the World came about after Willis O'Brien tried to get a film off the ground using his King Kong monster against Frankenstein's Monster. A script was written but never used. I would have loved to have seen that film. I am a huge King Kong fan and would have loved to have seen O'Brien given one more chance to bring life to the character that he birthed. The film that came out of all the backdoor dealings was Frankenstein Conquers the World aka Frankenstein vs Baragon. This is a fantastic film that many have heard about, but not many have seen because the disc has been out of print for a long time now. The film is just a lot of fun and has some great effects work by Eiji Tsuburaya, who birthed Godzilla, and would top himself in the effects department with this films sequel War of the Gargantuas. Check out the trailer and then find a copy of the film. The Man From Hong Kong Coming To Blu-ray!!! !